PHOTO COURTESY UNIVERSAL PICTURES Jake Gyllenhaal in "Everest." Following so closely on the heels of the gripping documentary "Meru," Icelandic filmmaker Baltasar Kormákur's 3D action-adventure, "Everest" — which chronicles the 1996 tragedy that befell a group of climbers who set out to scale the world's largest mountain — only emphasizes that the true message of any movie about mountain climbing seems to be "climbing mountains is a terrible idea." "Everest" is more disaster epic than true-life adventure tale, and following the template of such films, we're introduced to a massive cast of recognizable faces. Jason Clarke ("Dawn of the Planet of the Apes") portrays Rob Hall, owner of commercial climbing company Adventure Consultants, whose mission is to shepherd civilian climbers to Everest's summit. He allows people with the monetary means, but little actual experience, to do the impossible. Among those people are Beck Weathers (Josh Brolin), a gung-ho Texan, and Doug Hansen (John Hawkes), an unassuming mailman who's climbing the mountain in order to prove to a class of elementary school children back home that anything is possible. Also in their group is writer Jon Krakauer (Michael Kelly), tagging along to write a magazine profile on Hall and his company. Krakauer's best-selling book "Into Thin Air" also chronicled the ill-fated expedition. Hall's business partner, Helen Wilton (Emma Watson), acts as coordinator back at base camp. 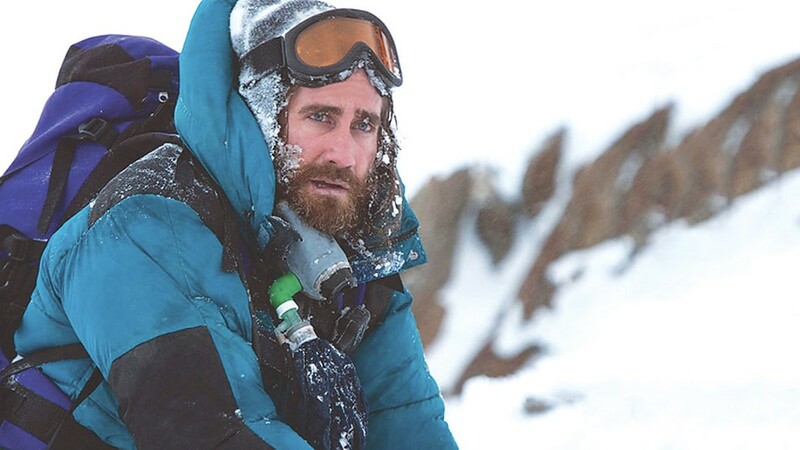 Then there's Scott Fischer (Jake Gyllenhaal), the leader of a rival expedition, bringing his own group of climbers up the mountain. But when a deadly snowstorm descends upon the climbers, stranding many atop the mountain, things go south rather quickly and their trek becomes a fight for survival. We also check in on Hall's and Weathers' worried wives back home, played by Keira Knightley and Robin Wright, respectively. As capably made as the film is, screenwriters William Nicholson and Simon Beaufoy have crammed so many characters into the narrative that the characters can't help but come across as two-dimensional types when we're given the CliffsNotes versions of who they are as people. I wished we got to learn more about Yasuko Namba (Naoko Mori), who seems the most invested in the climb. She's conquered six of the seven highest mountains in the world, and the completist in her demands that she finish the set. If you truly care to keep track of characters, be sure to memorize the colors of their snowsuits, because once the goggles come on and wind and snow is blowing, it's nearly impossible to tell who you're looking at otherwise. The film captures the combination of wonder, attraction to risk, and ego that makes someone become a mountain climber, even if it's never too concerned about the "why?" aspect of the story. The script spends an equal amount of time on the setup as it does on the peril, but once the storm hits, the film is unrelenting. Some of the most heart-stopping moments come when climbers, succumbing to the lack of oxygen and brutal cold, seem to lose their ability for rational thought; it's chilling to see some just suddenly wander off the edge, slipping silently into oblivion. "Everest" opened in IMAX 3D last Friday before rolling out to regular theaters this week, and the use of 3D makes for a visceral, immersive experience. The spectacular views are breathtakingly beautiful, capturing the altitudes in terrifying detail. Between this and "The Walk," anyone afraid of heights should probably skip the trip to the movies this month. Throughout, cinematographer Salvatore Totino makes a point to keep characters in frame as he captures the massive vistas — all the better to emphasize their ultimate insignificance in the face of the mountain's brutal majesty.